8K TV will be mainstream by 2020, study forecasts | What Hi-Fi? You may only just be getting used to 4K, but researchers suggest that the 2020 Tokyo Olympic games will fuel a drive towards even higher definition television. 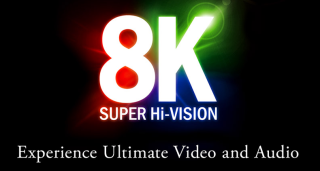 A study by Juniper Research predicts that 8K resolution, which delivers 33,000,000 pixels, will be widespread by 2020. The white paper, which examines the prominence of 4K television content in the US, argues that Japan's plans to broadcast the 2020 Olympics in 8K will serve as an incentive for the industry to increase sales of televisions capable of supporting those streams. The researchers hypothesise that 8K smart TV shipments will grow more than threefold between 2020 and 2021, to reach more than 400,000 per annum by the end of the forecast period. Sharp is the only manufacturer currently producing 8K televisions for the commercial market, but sales have been hindered because of the lack of 8K content. It's also predicted that by the end of the year, 15 per cent of TVs in the US will be 4K compatible, because of the increase in streaming services showing hi-res content, such as Netflix, Amazon Prime and others.